If you struggle with lower back pain that travels down behind your thigh or leg, you may have sciatica – a common, yet painful spine condition. Although sciatica pain often resolves on its own after a few weeks, for some people the pain keeps coming back or even gets worse, taking a significant toll on quality of life. 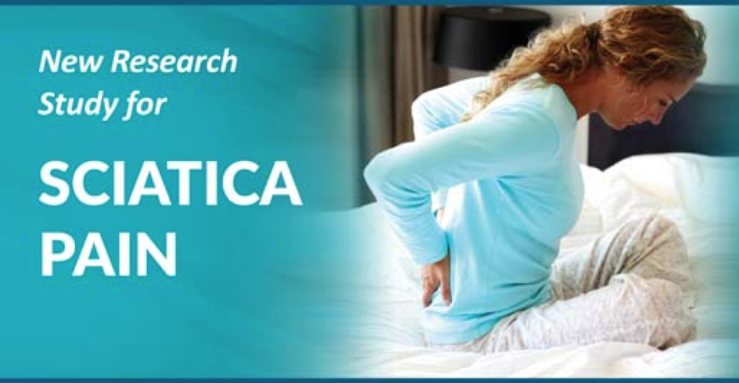 If sciatica pain is affecting your life, you may qualify for the CLEAR Clinical Study, now being offered at select research centers throughout the U.S. The study is for an investigational, non-opioid injection designed to relieve sciatica-related back and leg pain. If you qualify and choose to join the CLEAR Study, you will receive all study-related care at no cost. Sciatica refers to pain that radiates along the path of the sciatic nerve – the longest nerve in the entire body. The sciatic nerve begins in the lower back, and branches through the hips and buttocks and down each leg. Sciatica occurs when the sciatic nerve gets pinched, usually by a herniated disc in the spine. This pressure on the nerve causes it to become inflamed and irritated – resulting in pain, tingling, or numbness that starts in the lower back and travels down the leg. If you struggle with sciatica pain, you may qualify for the CLEAR Clinical Study. The study is evaluating SP-102, an investigational, non-opioid injection designed to relieve sciatica-related back and leg pain. SP-102 is injected into the lower back while at the doctor’s office. The CLEAR Study is currently being conducted at select locations throughout the U.S. If you qualify and choose to participate, you will receive all study-related care at no cost. This includes the SP-102 injection as well as any examinations or visits required for the study. The CLEAR Study lasts about 6 months. During this time, you will visit your study doctor’s office up to 9 times for both your initial evaluation, treatment, and follow-up visits to see how you are doing. You will also be compensated for your time and travel to attend these visits. How many people will participate in the CLEAR Study? About 400 people are expected to participate at approximately 35 study locations throughout the U.S.
As with all clinical studies, your participation is completely voluntary and you may choose to leave the study at any time without any effect on your future medical care. Physicians’ Research Options (PRO) is an experienced Clinical Research Company dedicated to the performance of Phase II, III and IV Pharmaceutical and Pilot/Pivotal Medical Device clinical trials. Our staff experience totals over 60 years in Clinical / Medical Research. Our staff recruits for and manages studies in Utah, Nevada, and Colorado.